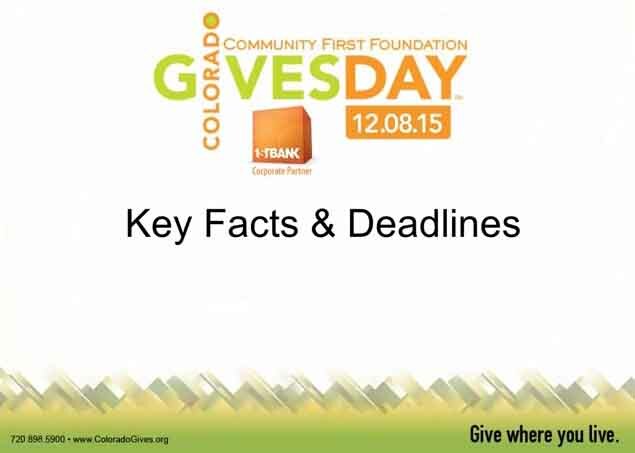 Get the Scoop on Colorado Gives Day – Fast! Is your nonprofit new to Colorado Gives Day? Or are you just seeking the lowdown for 2015? Either way, we encourage you to check out our short, informative videos. With a typical length of about 3 ½ minutes, you can get yourself and your Colorado Gives Day team up to speed. We highly recommend sharing them with your volunteers, board, and any others who have a role in the event. These and more support tools are located in the CO Give Day Nonprofit Toolkit. And while you’re at it, register for one of our most popular webinars: Winning Ways: How Three Nonprofits Met Their Goals on Colorado Gives Day, coming August 13 at 9 a.m. This webinar will give you a chance to learn how other nonprofits—ranging from small to large—pull in donations and new donors on Colorado Gives Day. This is your chance to glean ideas from experienced participants and ask questions directly. Join us!